Ilona Kudina appears at Scullers on April 6. 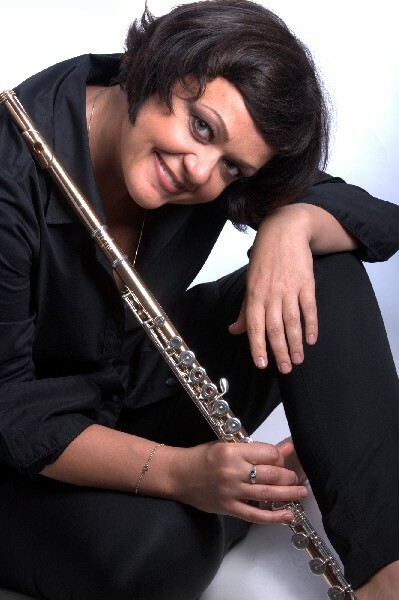 Ilona Kudina, who hails from the tiny Republic of Latvia and who has been living in Boston since 2001, is a fine flutist Informed by rigorous childhood classical training in Europe but equally comfortable in jazz genres. Her impeccable classical performances have been recorded on several CDs and she has been heard in many classical and jazz concerts throughout the Greater Boston area. A flutist, composer, arranger, band leader and producer, her performing career began at age six. She has toured extensively throughout the United States, Canada, and Europe. Now, Kudina is releasing a compelling CD focusing on her first musical love, jazz. The CD is called Nothing But Illusion releases on March 9 and will be available at www.ilonakudina.com, on iTunes, CDBaby, Amazon and various internet CD outlets. With her stellar recording band, The Ilona Jazz Quintet, spanning two generations and two continents featuring legendary drummer Billy Hart, trumpet titan and Berklee faculty member Greg Hopkins together with two bright lights of the younger generation of jazz players--pianist Vardan Ovsepian and bassist Akili Jamal Haynes, Kudina will perform at Scullers Jazz Club [DoubleTree Guest Suites Hotel, 400 Soldiers Field Road, Allston, MA 02134] on Tuesday, April 6 at 8:00 PM. Tickets at $20.00 can be purchased on line at www.scullersjazz.com or by calling, 617-562-4111. Scullers is wheelchair accessible. On the new CD Nothing But Illusion, Ilona Kudina and her band present original material creating a sensual, cosmopolitan, immaginative hybrid of American and European jazz styles. The powerful influence of Miles Davis is clear in “And So What”: this tune shows Kudina’s edgy side, an ugly beauty. “Dangerous Liaisons,” in E flat minor, evokes the grief of heartbreak while “Nothing But Illusion,” the title tune, is a sweet, poignant ballad of daring to love again. “Tumsha Nakte, Zala Zale” is inspired by an ancient Latvian melody. “Zidi, Zidi Rudzu Vorpa” builds upon a traditional folk song that captures the dynamic, passionate nature of the Latgalian region of Latvia. As a child growing up in Latvia, jazz was completely frowned upon by Ilona Kudina’s classical teachers . . . but Kudina was hooked. In Riga, where Ilona is from, a few jazz clubs with an American ‘50s ambiance were in business. Musicians such as Charles Lloyd, Jan Garbarek, Dave Brubeck, Billy Harper and others performed there. Ilona connected with the hottest tenor player in the U.S.S.R.: Raimonds Raubisko, who had performed with Grover Washington, Jr. at Ronnie Scotts in London. He was considered a groundbreaker for jazz in Latvia at the time. Impressed after allowing Ilona to sit in on one of his Riga gigs, he established the jazz quartet “Flute Fever,” featuring Ilona on flute, piano and vocals. Since there was no university with a “jazz department,” Ilona “studied” everything she heard during these rather ‘underground’ opportunities, and learned about jazz directly from the musicians and recordings. On a typical day, she rehearsed in the morning as a classical flute and piccolo artist with the Latvian National Symphony Orchestra; in the afternoon she taught at the P. Jurjana Music School and in the evening she played with the symphony orchestra. This was then followed by a late night gig with jazz cats! In 2000, Ilona won a Berklee World Scholarship to Berklee College of Music. Ilona emigrated to Boston to attend the legendary jazz school, then got divorced and put down roots. Ilona succeeded at Berklee not only in public performances but also in teaching and recording. “Jazz became my passion. When I came to Boston in 2001, my first roommate gave me a copy of Miles: The Autobiography. Miles became my biggest influence. Whenever I would need advice about my music, I would read Miles’s interviews and his book and that would give me some answers.” In Boston, she studied flute with Wendy Rolfe, Matt Marvuglio and Fernando Brandao and jazz studies with Joe Lovano, George Garzone, Dave Samuels and Bill Pierce. Ilona became a fluent jazz composer and arranger and performed at the 2009 Beantown Jazz Festival and at JazzFest Falmouth with the Greg Hopkins Orchestra. Though deeply smitten with jazz, Ilona never lost track of her classical world. She has performed in solo recitals and chamber music projects in Boston, Minneapolis, New York City, Washington D.C., Toronto and Hamilton (Canada) and she has also performed with the Boston Metropolitan Orchestra. In 2006 she connected with Boston’s Latvian community and released the CD On The Bridge [Uz Tilta], featuring compositions for classical flute by wonderful Latvian composers from around the world. For this CD, she received the Award of Achievement by The World Federation of Free Latvians. In addition, she frequently produces concerts for the Baltic American Society. In 2010, she established the Amber Flute Quartet featuring four Estonian composers and it is dedicated to the 50th Season of the Baltic American Society of New England. A special CD release concert was held at the First Church of Boston.